Humans are crazy. And weird. And today I say this in a negative way. Yeas, we do kill each other also. Sometimes. But not massively. And we do pick the fight with a specific guy. And we do not use guns, but our bear claws and teeth. So it’s an even fight. We do not hate entire populations just because they are different. 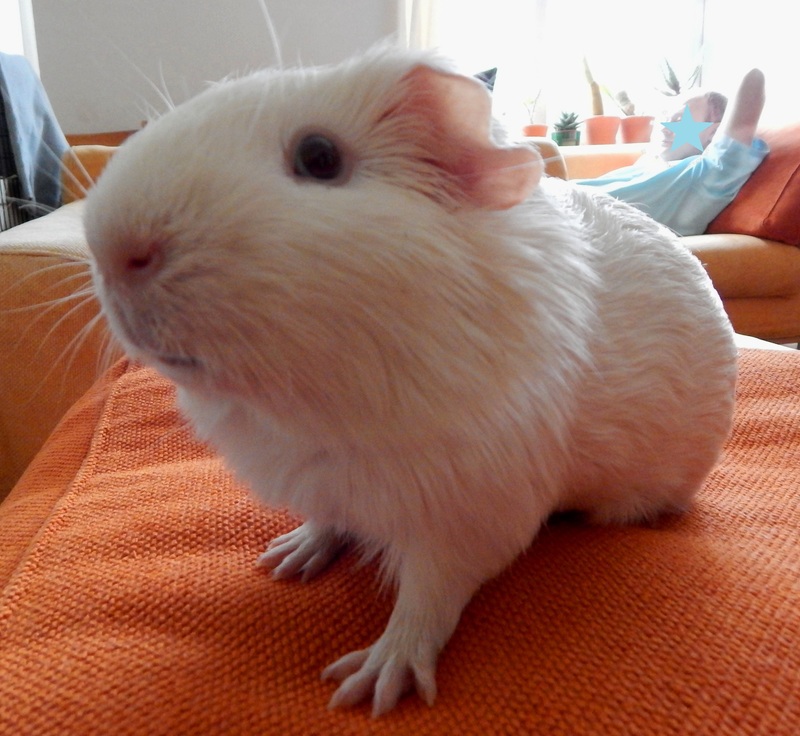 Imagine how it would be for the white piggies with red eyes to hate all the Rex piggies. Yeap, it sounds crazy! Yesterday some humans from Brussels, Belgium, Europe blew themselves up in the Airport and in a metro station. Due to this, now there is panic in the city. Of course our HF panicked a little too. She managed to check on the HM and the baby, but could not check on us. We were not in an area of interest, but still she would have loved to make sure we are fine. Now, she has no idea we could write an email so this was not an option for her. Actually she has no idea we could communicate with her somehow. What is wrong with you, people?! Did it cross your mind to ask us if we would like to go live on the Internet?! Whatever… No consideration for us. I will have to ask the guys to come up with a revenge plan. In the meanwhile, we decided to sabotage the webcam and make sure it’s not broadcasting live and open on the Internet. I would really hate to see unapproved photos with my white but all over the online environment. Moreover, I plan on turning on that camera only when we are in the mood for it. Our humans should never learn that we are able to write emails, take care of a blog, Facebook page and so on. Because I suppose she will be so amazed by our skills that she will ask us to ghost write for her. Which is a no go! I love my life as non-busy as it is. Since yesterday, I lost contact with Worf. A big white and opaque fence grew between us. True, we never had a clear view to his room, but still we could touch noses and look over the fence to check what’s up. But yesterday all this changed. We are talking about the jealous Kirk and the self-sufficient Worf. And they are both gourmands. Moreover, Kirk is that type who thinks that just because he is bigger, he can bully everyone else. Just that usually he gets out of the fight with scratches and bites. 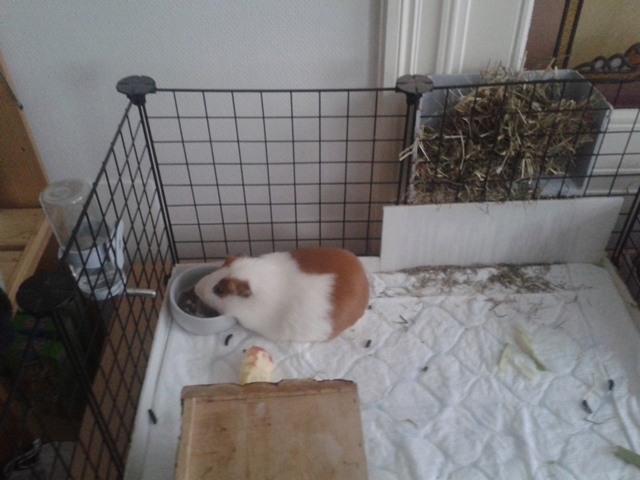 And Worf just loves to be left alone with his food. Then why paring them?! Because the humans believe they will be happier after all. Maybe they will even enjoy cuddling. Since yesterday they are together. No fight, no biting, just the usual trials to show dominance. Also, Worf is somehow cornering Kirk and prevents him sometimes to get to the food. And now the humans are not afraid about real wounds, but about some psychological drama. Maybe a very sad Kirk… Because Worf looks like he would like to be more sociable wit Kirk. 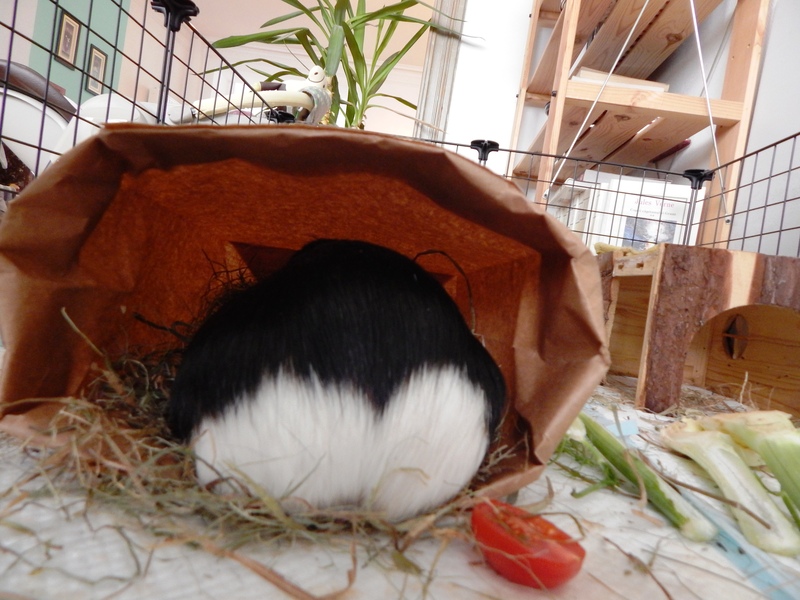 But, although I can’t see him, I hear some small normal noises from Kirk, so maybe everything will be fine after all. 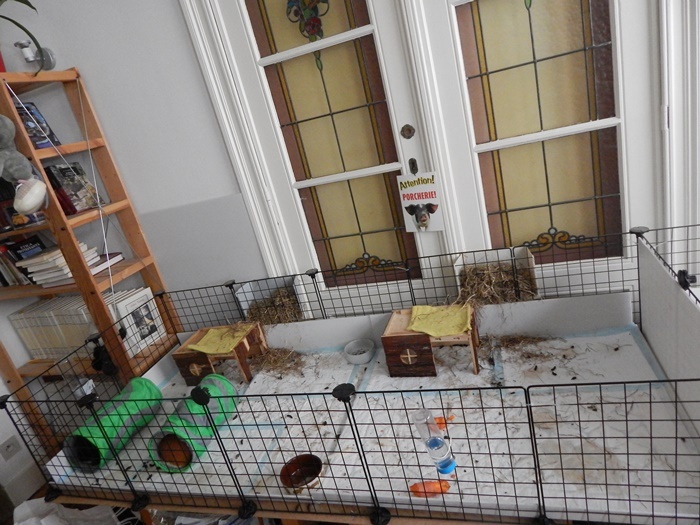 Anyhow, the hf is super attentive, refused to leave the house today and woke up several times over night to check on them. Maybe, in time, Kirk and Spock will be able to behave when they get closer and the white opaque fence will be removed from the grids. We will keep you posted. We trained our humans to be much organised in regards with our menu and grocery shopping. So they both take turns in going to the supermarket and grocery’ lists are something common in our house. And usually on Fridays is the hm’s turn to buy fresh veggies for us for over the week-end. Last Friday the hf prepared the list and, as we pass through a period in which we don’t really enjoy bell peppers, she thought of giving us more from the other veggies. 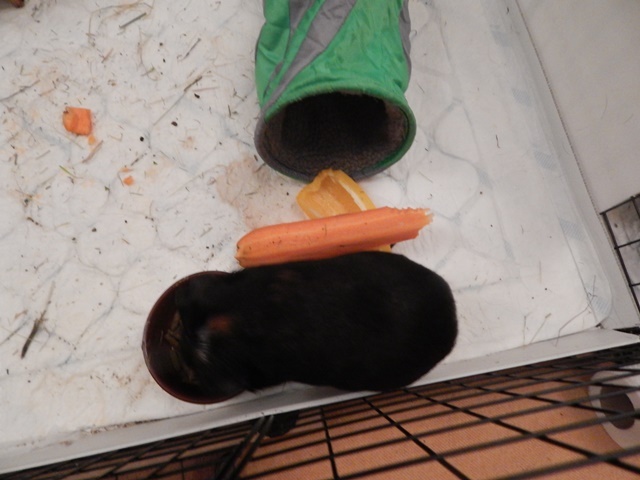 For Saturday evening we had planned carrots and pepper, so she wrote on the list: one yellow bell pepper and one “biiiiig carrot”. This is what the hm male brought home! 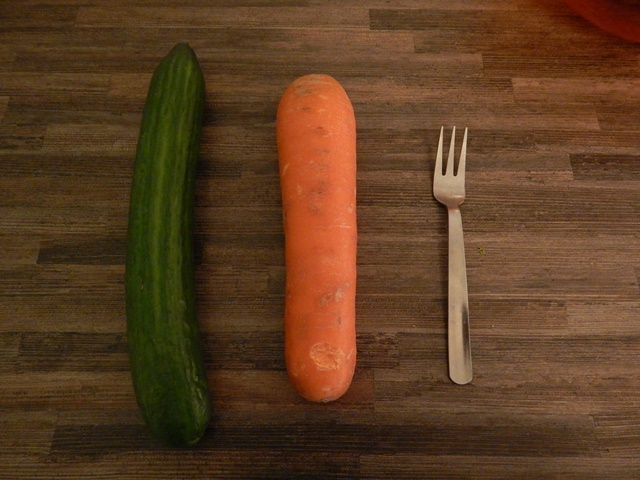 Trust me that cucumber is a normal one and the fork also. So we’ve got each one quarter of a huge carrot. It was difficult to handle, but we’ve managed. Now, do not worry! 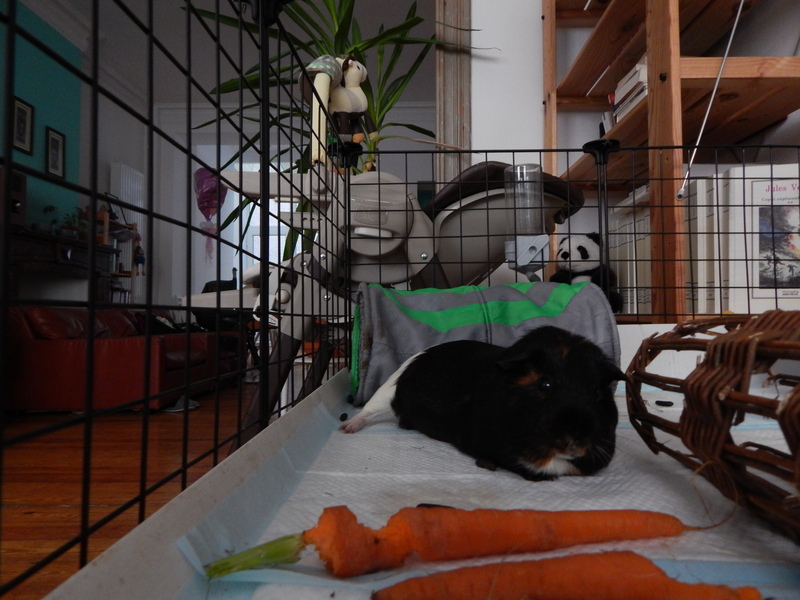 Nothing serious happened, just that so much food made me sleepy. 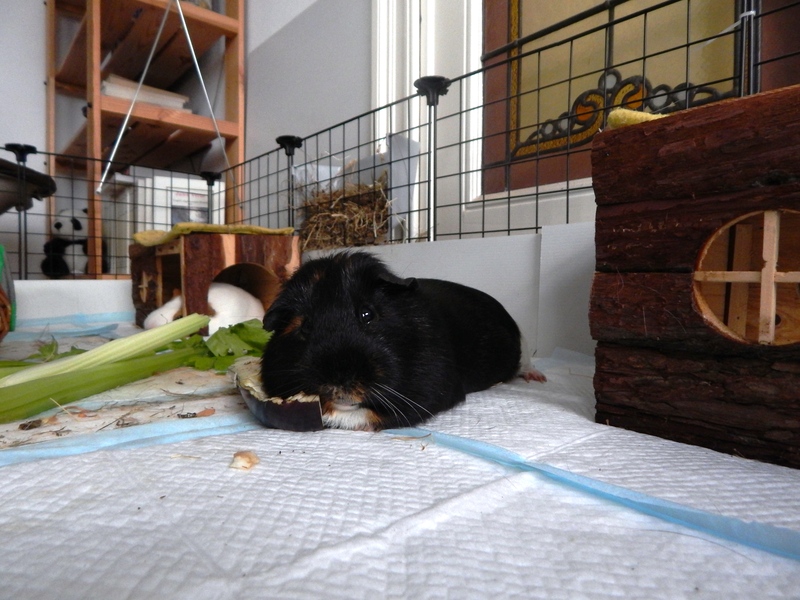 And, even though I haven’t ate everything, just the thought of having so many pellets made me tired. Just because I had to cope with the urge of eating them all at ones… But I went for the wiser option, kept calm and had them in small amounts during the whole day. But enough with these pellets! They were not everything that happened on Sunday. The celebration day started with the regular Sunday weighting (I know, no fun at all!) and with a complete cleaning of our rooms. The human female fed us and this was when I’ve got a bowl full of pellets instead of only one spoon. But not only me: the other three also benefited from the same treatment. Just look at Kirk how lazy he got! And the white part of the gang had some priceless looks when interupted. In the afternoon I’ve got some floor time with Kirk. 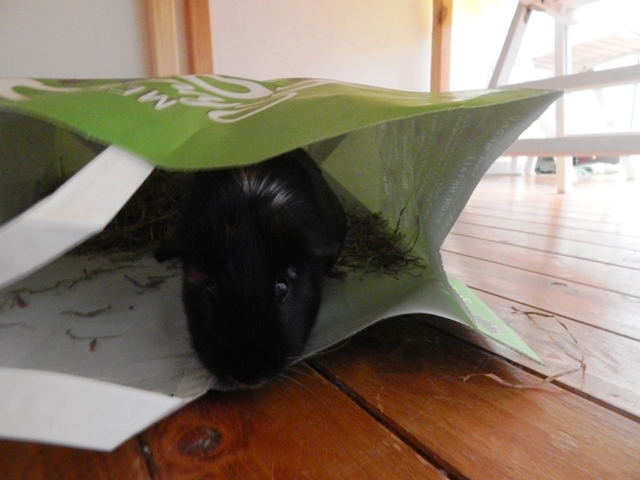 And a huge paper bag to play in. 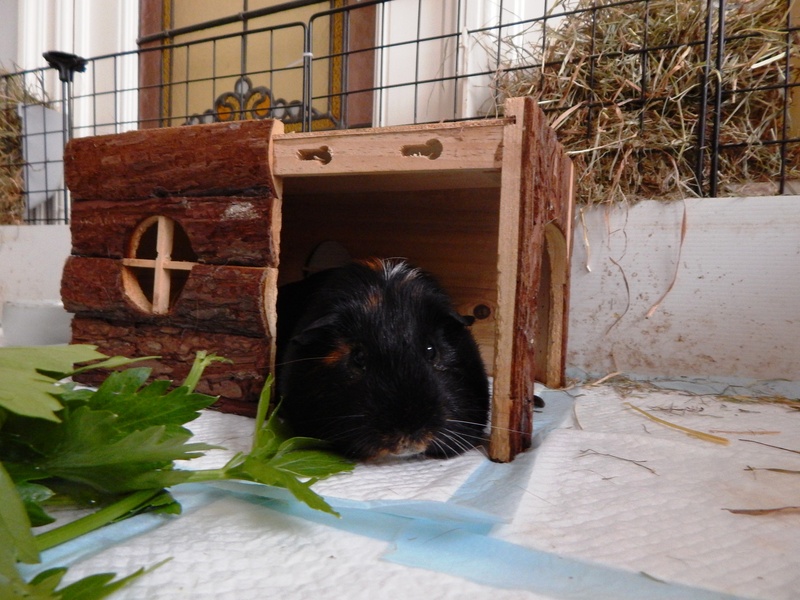 Filled with hay! 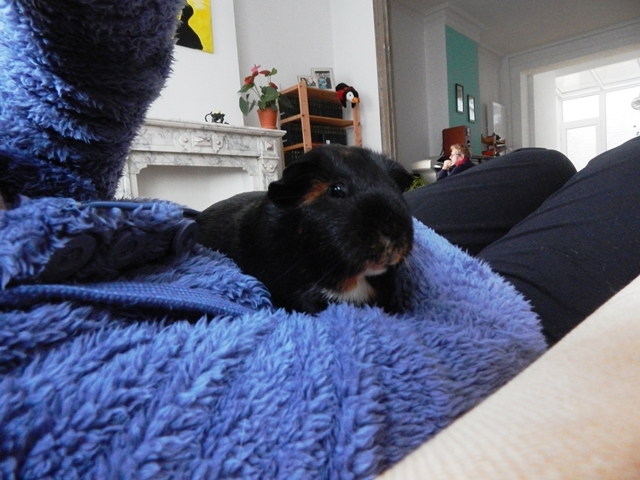 Of course, the human female was in charge of taking photos. After the play time in the big bag, I’ve got to cuddle in the new anorak and I must say the colour suits me well. I think the human managed to take some of the few photos where my eyes are differentiating from the rest of my shiny fur. After all, I am photogenic. Today is Worf’s birthday. The one approximated by our humans after complex calculations… So, happy birthday dear Worf! As I met him first and we also shared a room for a while, it is my duty to write something about him. Also, I think it’s a nice gesture given the fact that we need to mark the moment and Worf is too tired after the yesterday’s celebration. Because we’ve celebrated yesterday, as it was Sunday and humans were around. Now I wonder what should I write about him?! 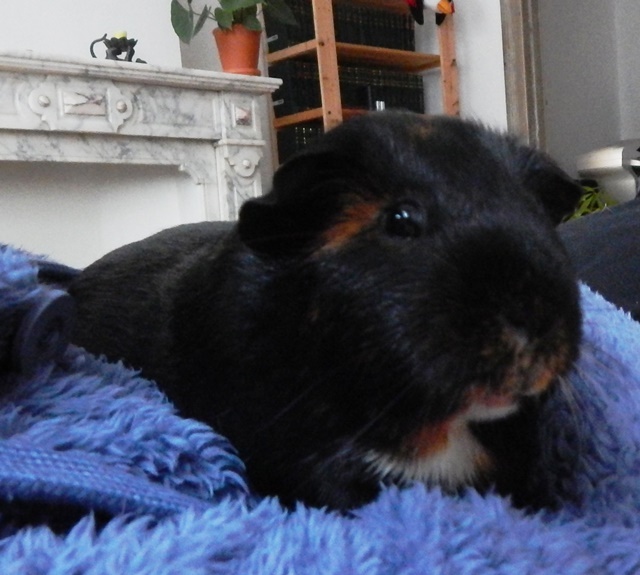 I think everybody knows already that he is shyer than the rest of us, loves to cuddle in soft anoraks and is pellets addicted. 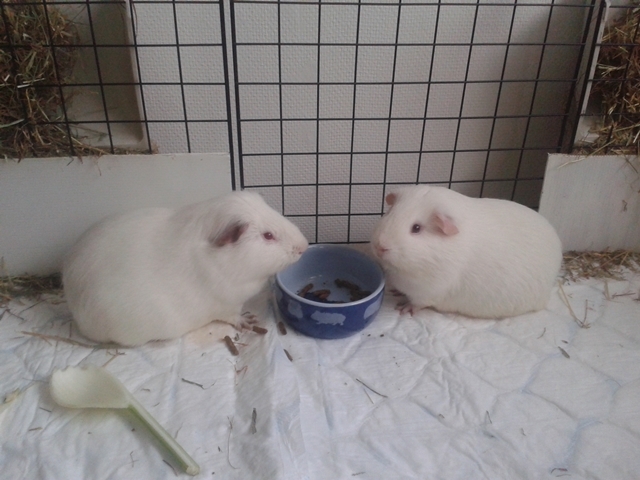 We shared a small cage in the pet shop, I’ve tried to teach him how to impose himself in front of rabbits with no success and we came together in The Gang due to the fact that the human male fell for Worf’s white bum and decided I could no longer live in a pet shop. 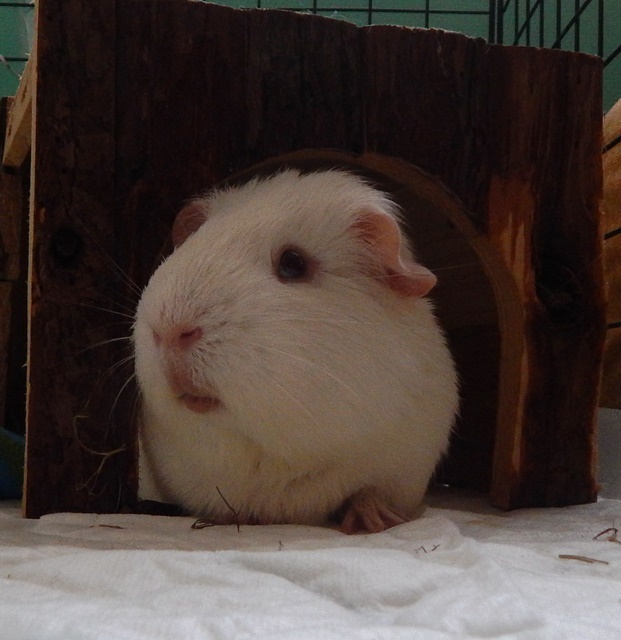 Worf is a little geek who loves living on his own, although he doesn’t seem disturbed by sharing some floor time with Kirk. They even get along just fine, but sharing the same room may be problematic. He also loves to hide in blankets and other soft spots and refuses to leave the human female anorak whenever he gets there. Oh, and he is the only one who can stay one hour cuddling without peeing and pooping. I’ll go check on him now and see if he could tell you how he partied all day long yesterday. 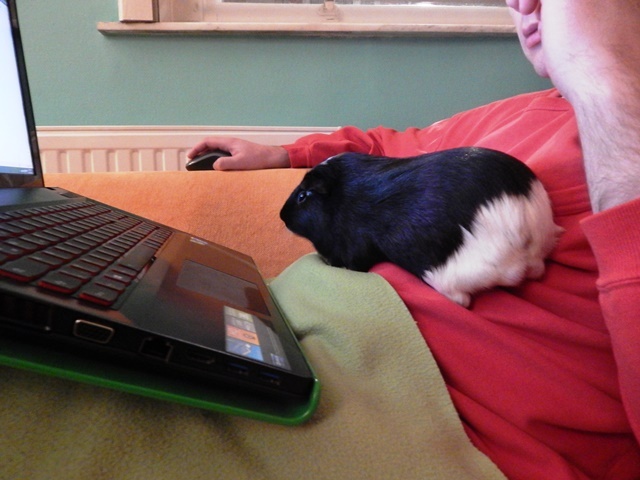 But not before showing you a photo of Worf exploiting the human male and his laptop.